The Phillies entered the offseason knowing the organization needed an upgrade on the left side of the infield. The production at shortstop and third base - looking specifically at Wins Above Replacement level - ranked last in all of baseball. The 28-year-old All-Star hit .304/.341/.415 with 29 doubles, 10 homers, 20 steals and 91 runs last season with Seattle. The Phillies acquired him on Monday from the Mariners, along with right-hander Juan Nicasio and left-hander James Pazos. In return, the Phillies parted ways with shortstop J.P. Crawford and first baseman Carlos Santana. Crawford, 23, never lived up to the hype in Philadelphia. A once highly touted prospect by Baseball America and once the highest ranked prospect in the Phillies' organization, he struggled mightily at the big league level. Through 72 games over the past two seasons, he slashed. .214/.333/.358. As for Santana, the first baseman inked a three-year deal with Philadelphia last offseason for $60 million. The 2018 season was a strange one for the 32-year-old as he finished with a 1.7 WAR and a 105 OPS+, but hit just .229 - a career-low over his nine big league seasons. Moving Santana means the Phillies have a clear path to move slugger Rhys Hoskins back at first base. 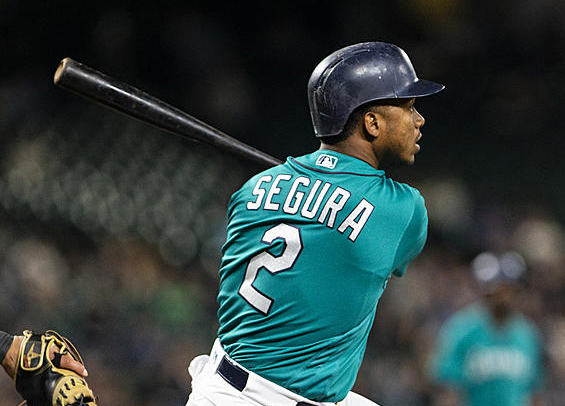 The real gain here though is Segura. He's signed through 2022 and at a price tag of $60 million. He can hit at the top of the lineup and is an above average defender with experience also at second base. He immediately makes the Phillies a better ball club. "He moves the needle quite a bit," Phillies general manager Matt Klentak said in a conference call with reporters on Monday night. "Probably by several wins." The pitchers packaged in the deal provide bullpen depth, with both projecting as potential late inning pieces for manager Gabe Kapler. Nicasio, 32, made 46 relief appearances for the Mariners last season and tallied 53 strikeouts to only five walks in 42.0 innings pitched, as he posted the best strikeout-to-walk ratio among all American League relievers (10.60 SO/BB). He made a pair of appearances with the Phillies during the 2017 season after being claimed on waivers from the Pittsburgh Pirates in September of 2017. Pazos, 27, posted a 2.88 ERA over 60 relief appearances, 13th-best among all left-handed relievers in the majors last season.